The health benefits obtained by developing a proper stance are not restricted to the musculoskeletal system but extend to all areas of the body. 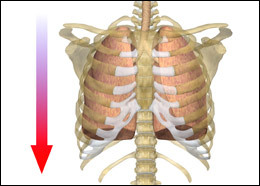 For instance, the lungs can do their best job when our posture is good enough to allow the rib cage and the diaphragm muscle to expand properly. The exchange of oxygen between the lungs and the blood is thus improved and less effort is required to breathe and speak. It's easy to take breathing for granted, and we often forget that when inhaling we don't really pull any air in; instead we just expand the thorax and the abdomen outwards so air rushes in passively to fill in the vacuum this expansion creates. Adequate posture is essential for proper breathing during all kinds of exercises, but it is particularly important during competitive sports because of the high oxygen demand (you never see sprinters slouching during the one hundred meter dash). Even lesser challenging activities like singing require a good posture. Any experienced voice coach will tell you that proper posture is a must for a singer's voice to sound strong, travel far, and do so without strain. If you want further proof of the importance of one's stance when breathing, try this experiment: curl your spine and shoulders into a slouched position, exhale and hold your breath. Now try to stand up straight while still holding your breath. You'll feel the vacuum that is created inside your chest and abdomen when you correct your posture, compelling you to take a breath. This represents the amount of breathing space you lose, the extra lung volume you're missing when you're slouched. Form follows function, and standing up straight not only allows the abdominal organs to function better, but it also improves the shape of the body in ways that are immediate and profound. For instance, one of the major complaints of mature women (and men) is a growing "belly pouch," an abdominal distention that afflicts even thin people as they age and that can't be resolved by liposuction or sit-ups alone because it is due to the protruding viscera pushing against the abdominal wall. The shrinking internal volume of the abdomen that forces the guts to bulge is mostly due to the loss of height of the lumbar spine that accompanies age (think of what happens when you squeeze an Oreo cookie). 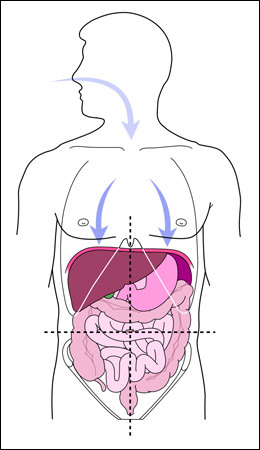 By straightening up the body you can trim several inches from the waist simply by increasing the distance between your lower ribs and the pelvis, allowing greater volume for the internal organs to spread, and instantaneously reducing an unsightly "beer belly" or a "grandmotherly bulge."